Russo–Japanese ties gained traction throughout 2016 after over two years of marked stagnation brought on by the Ukraine crisis. In mid-December, Russian President Vladimir Putin visited Japan, indicating that a Russo–Japanese rapprochement is clearly taking shape. Unfazed by stirring discord in the G7 and the anti-Putin sanctions regime, Abe seems bent on presiding over a resolution of the decades-old territorial row. But amid this Russia–Japan honeymoon, Abe should not lose sight of the perils of a charm offensive with Moscow, especially in the wake of the Donald Trump victory. In May 2016, Abe and Putin announced that they were planning to tackle the Northern Territories (referred to in Russia as the Southern Kuril Islands) dispute with an undisclosed new approach. Abe also unveiled an eight-point plan for economic cooperation, including joint projects in Russia’s Far East. While it has not been officially confirmed, there is evidence to suggest that the two announcements are directly connected. It is likely that Abe intends to use closer economic ties to sway Russia towards relaxing its hard-line stance on the Northern Territories. At the same time, Abe realises that merely giving to Russia without asking for anything in return would take a toll on his public support. Abe is striving to achieve tangible progress and strike a deal on the disputed territory at any cost, even if it means short-term political fallout. He hopes that the diverse economic cooperation plans will hasten the dispute’s resolution. But such optimism on Abe’s part seems unwarranted. Putin’s recent visit to Japan, which predictably ended with further economic agreements but no resolution of the Northern Territories dispute, seems to have confirmed this. There are two reasons that this optimism is unwarranted. First, Russia has the upper hand. While Japan has already played its best cards — approaching Russia when no other G7 country would and offering lucrative economic deals — Moscow has not signalled that it is willing to compromise its position on the disputed territories. During an interview before his Japan visit, Putin told the press that Russia does not have a territorial problem with Japan, and it is only Japan that believes so. It appears that Tokyo is much more interested in finding a quick solution than Moscow. Even a deal where Russia transfers just two of the four disputed islands to Japan in accordance with the 1956 Soviet–Japanese Declaration looks unlikely. With Russia enjoying a stronger hand in the negotiations, it has no incentive to rush the signing of any agreement. Instead, it can simply continue to reap the fruits of a strengthened economic partnership. Second is Abe’s foreign policy strategy, which is underpinned by values-oriented diplomacy that emphasises the need to work with and assist like-minded countries that share values like democracy, human rights and a maintenance of the rule of law. The confrontational nature of Abe’s China policy stems in part from the idea that China is a renegade state that ignores these values and disregards international law. The question arises then of how to rationalise Japan’s overtures towards Russia given that it should be ostracised as per Japan’s diplomatic doctrine. By opting for a pragmatic attitude towards Moscow, Japan puts into doubt its traditional identity as a ‘reactive’ state and a responsible member of the international community. Such an approach effectively normalises Russia’s annexation of Crimea, which represents precisely the approach — changing territorial status quo by military force — that Japan rails against when dealing with China. Another danger lies in Donald Trump’s victory in the US presidential election. While it is still unclear whether Trump’s Russia policy will be as accommodating as it seemed on the campaign trail, a Russia–US détente is possible. Trump’s emphatic denial of the possibility of Moscow interfering in the US election, his Chief of Staff Reince Priebus’ refusal to commit to keeping the sanctions regime and Trump’s pick of Rex Tillerson for Secretary of State all suggest that his administration is likely to adopt a softer approach towards Moscow. 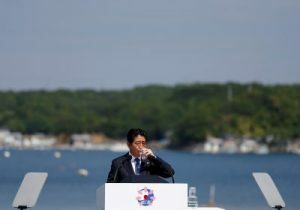 In such an event, Japan’s unique position as the sole Russia-friendly G7 state will be essentially negated, making Putin even less inclined to reach a deal on the disputed islands. With few diplomatic achievements to show to the Japanese public since the start of his premiership, Abe is understandably intent on reaching a historic deal with Russia and consigning the long-standing territorial row to history. But Abe’s desire to leave a legacy clashes with the harsh reality of Russo­–Japanese relations, and his overt approach towards Moscow seems misplaced. Abe still has enough time to avoid damage to Japan’s international standing by taking a more measured, principled stance on Russia. Otherwise, all his investments — both literal and figurative — are unlikely to pay off.